If a sentence has only one subject and one verb, it is said to consist of a single clause, called the main or principal clause. A main clause is a clause which can stand alone to form a complete sentence. Each of the following sentences has only one clause. In the following examples, the verbs are underlined. If a sentence contains more than one verb, and each verb has its own subject, the sentence is said to consist of more than one clause. The following sentences each have two clauses. The verbs are underlined. e.g. He said that he was ready. The door opened, and my uncle entered the room. In the first example, he said is the first clause, and that he was ready is the second clause. In the second example, the door opened is the first clause, and my uncle entered the room is the second clause. When two clauses are joined by a word such as and, or or but, the two clauses are called coordinate clauses, and the word which joins them is called a coordinate conjunction. In the following examples, the verbs are underlined. e.g. It is cold, but the flowers are blooming. The flowers are blooming and the birds are singing. In the first example, the coordinate conjunction but joins the clause it is cold to the clause the flowers are blooming. In the second example, the coordinate conjunction and joins the clause the flowers are blooming to the clause the birds are singing. The clauses in these examples are coordinate clauses. Coordinate clauses are main clauses. A main clause is grammatically independent, in that it may stand alone to form a complete sentence. In contrast, a clause which describes some part of the main clause, or which is in some other way grammatically dependent on the main clause, is called a subordinate clause. A subordinate clause cannot stand alone to form a complete sentence. 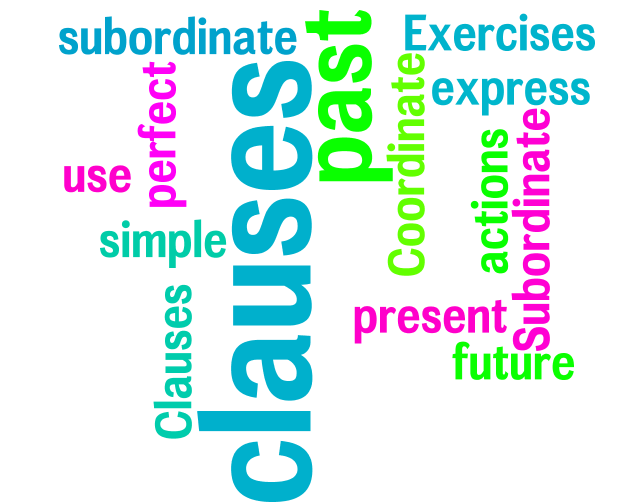 In the following examples, the subordinate clauses are underlined. e.g. The book which I lent you is a library book. He told me what he had seen. If you are ready, we will go. In the preceding examples, the main clauses are the book is a library book, he told me and we will go; and the subordinate clauses are which I lent you, what he had seen and if you are ready. A subordinate clause usually begins with a connecting word or phrase which joins it to the main clause. In the preceding examples, these connecting words are which, what and if. It has already been seen that the tense of a verb in one clause is related to the tenses of verbs in other clauses in the same sentence. For instance, if one action happened before another in the past, the action that happened first would usually be expressed by a verb in the Past Perfect tense, and the action that happened subsequently would usually be expressed by a verb in the Simple Past tense. For instance, each of the following sentences has one verb in the Past Perfect tense, and one verb in the Simple Past tense. In the following examples, the verbs are underlined. e.g. She was late, because she had lost her way. It had started to snow before we reached the inn. In the first example, the verb had lost is in the Past Perfect, and the verb was is in the Simple Past. This indicates that the action of losing the way occurred before the action of being late. In the second example, the verb had started is in the Past Perfect, and the verb reached is in the Simple Past. This indicates that the action of starting to snow occurred before the action of reaching the inn. It should be noted that if the verb in the main clause of a sentence is in a future tense, the verb of any subordinate clause which refers to the future is usually in a present tense. This is illustrated in the following examples. The verbs are underlined. e.g. We will welcome him when he arrives. I will have finished the work before it is time to leave. In these examples, the main clauses are we will welcome him and I will have finished the work; and the subordinate clauses are when he arrives and before it is time to leave. In the main clauses, the will welcome is in the Simple Future tense, and the will have finished is in the Future Perfect tense. However, in the subordinate clauses, the verbs arrives and is are both in the Simple Present, even though they refer to future events. In most cases, the rule is that if the verb in the main clause of a sentence is in a future tense, the verb of any subordinate clause which refers to the future must be in a present tense. There is usually no ambiguity in such sentences, because the fact that the verb in the main clause is in a future tense is generally enough to indicate that all of the actions expressed in the sentence are to take place in the future. However, there are a few cases in which the verb in a subordinate clause must be put into a future tense in order to avoid ambiguity. For instance, in subordinate clauses beginning with although or because, it is sometimes necessary to use future tenses, to make it clear that the actions expressed relate to the future, rather than the present. e.g. We will not need to send for her, because she will already be here. Although he will be in the neighborhood, we will have to search for him. In these examples, the use of the Simple Future tense in the subordinate clauses because she will already be here and although he will be in the neighborhood is necessary to make it clear that the events of her being here, and his being in the neighborhood, relate to the future rather than the present.